One year after Rev. 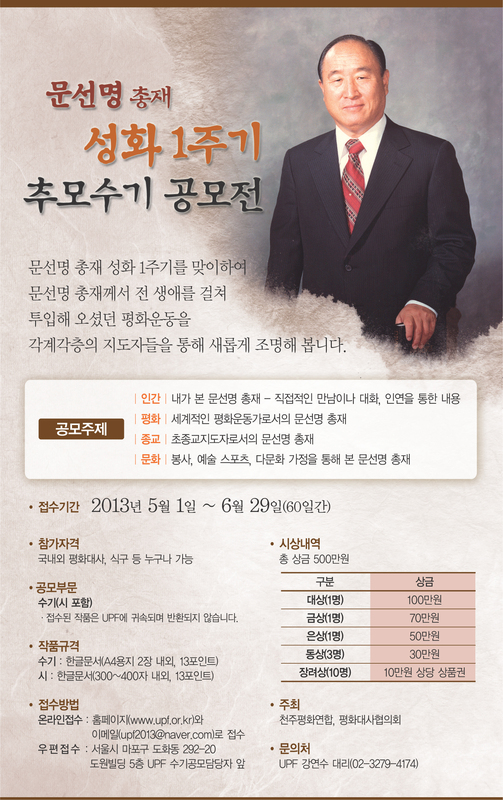 Sun Myung Moon’s Seonghwa (Ascension), the Universal Peace Federation (UPF) in Korea and the Peace Ambassadors Council will memorialize his life-time devotion and dedication toward a peace movement with a literary contest composed of memoirs or poems from leaders and church members commemorating his life. Submissions in any language may be entered in the contest. The following are specifications for entries in the contest. Eligibility: Peace ambassadors from any country and any church members. All the submitted compositions will belong to UPF and will not be returned.